SKF launches the SKF Energy Efficient (E2) tapered roller bearing (TRB), especially designed for truck final drive applications that reduces friction, enables less fuel consumption and reduces emissions in heavy trucks. This product is part of SKF’s BeyondZero portfolio*. “All our product engineering efforts are focused towards having solutions that are energy efficient, long lasting and reducing cost for the truck and fleet owners. They should also be easy to install and cost efficient. It is all about saving money and time, but also reducing negative impact on the environment”, says Christian Genheimer, Product and Business Development Manager for business unit Trucks, SKF. 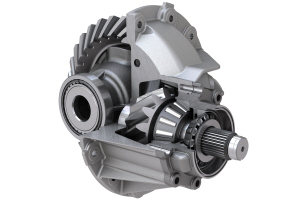 The SKF E2 TRB has been designed to reduce fuel consumption. Typical fuel savings achieved using this bearing in a truck final drive are approximately 0.15 l per 100 km, which for vehicles used on long haul routes adds up to an estimated annual saving of 150 litres per year. This gives a fast return on investment over time for truck and truck fleet owners, reducing total cost of ownership. In comparison with SKF standard TRBs, that already provide high performance in this category, the new SKF E2 TRB has been further improved with a friction reduction calculated at 30 percent. This can enable energy savings of approximately 500 watts when the bearing is used in the pinion position. Unlike competing products, this friction reduction is valid over the complete rpm range.For a typical truck running 100 000 kilometres per year, equipped with four bearings of this type, the reduction is estimated to 398 kgCO2 saving per year. Specific features of the new bearing include fewer rollers, improved roller topography and modified raceway profiles. The improvement of rollers means that, despite their reduced number, the SKF E2 TRB offers the same nominal carrying capacity as standard TRBs. The new SKF E2 TRB is interchangeable with the current standard TRBs which makes implementation easy and cost efficient. * To be included in the BeyondZero portfolio, SKF products, services and solutions must be demonstrated to deliver significant environmental benefits to the customer, without significant environmental trade-offs elsewhere in the product life cycle.